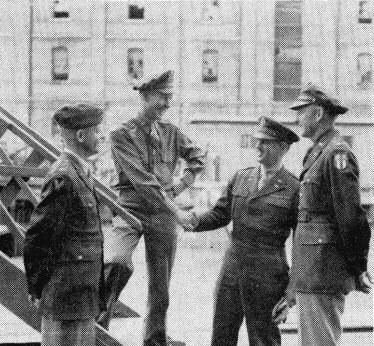 The first contingents of the 12th Air Service Group arrived in the China Theater in January 1944. By the time all the components had arrived, the 12th included the headquarters squadron, the 1066th Quartermaster Company, the 1102nd Signal Company, the 2124th Quartermaster Truck Company, the 1835th Ordnance Supply and Maintenance Company, and 397th Air Service Squadron. Robert Koshland commanded the 12th A.S.G. from the time it left the States until February 1945 when his second in command, Robert Wise, replaced him. Wise was later replaced by Maurice Hollman, and the last officer to command the several units was Neil Maurer who came home with the men on board the "Adabelle Lykes" which sailed out of Shanghai on November 17, 1945. The first air service group in China was the 54th. This squadron grew out of the needs of the American Volunteer Group and later the China Air Task Force. It was absorbed by the 12th early in 1944. The 12th A.S.G. was responsible for the maintenance of all aircraft of the 14th Air Force, for provisions and supplies to feed and house all 14th Air Force personnel. Its area of responsibility took in everything east of Kweilin to the China coast south of Hankow and Shanghai. Chinese-American Composite Wing units and elements of the 69th Composite Wing, based in Yunnan province, were also serviced by the 12th whenever their aircraft staged off Liuchow and Nanning. 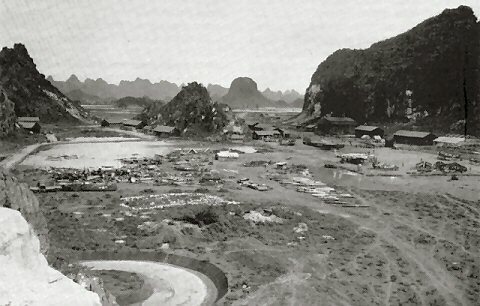 Partial evacuation of the Yang Tang base began on June 23, 1944 when enemy forces occupied Lingling and were threatening Kweilin. Units of the 12th A.S.G. came under constant attack from Japanese aircraft, especially in night raids, which kept the men in their caves and slit trenches night after night whenever there was moonlight. The final evacuation of Kweilin for the 12th began on September 14th and the last group left Liuchow on November 8, 1944. Men and equipment were moved by air, by riverboat, by truck and by rail west to Luliang and Yangkai in Yunnan province. 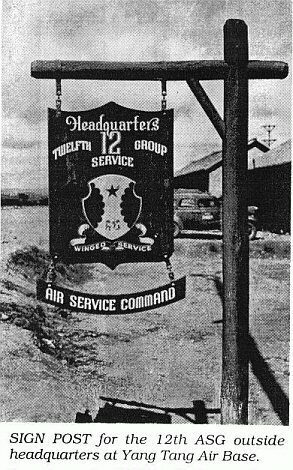 In February 1945, the headquarters squadron moved from Luliang to Chanyi, and in March to Peishiyi to service the Chinese-American Composite Wing. From July to October 1945, the 12th was based, in part, at Chihchiang and after the war, these units moved to Hankow, and finally down river to Shanghai for the long-awaited trip home. Three other units, the 369th Service Squadron, the 1836th Ordnance Supply and Maintenance Company, and the 2459th Quartermaster Truck Company, which had remained behind at Liangshan (northeast of Chengtu), was returned to India for shipping out of Calcutta.